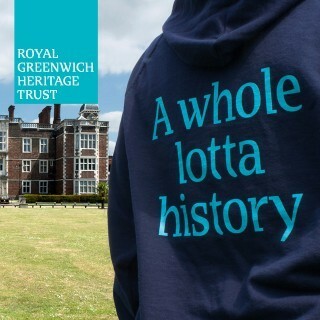 It has been a privilege to work with Heritage of London Trust Operations to raise the profile of this stunning historic site and bring a new lease of life and use to the local community. Working closely with the client we have created a new responsive website, designed and manufactured a new interpretation panel to share the story of the Church with all, created new leaflets to understand the site better and branded the gates to make the site look alive and engage with passers by. 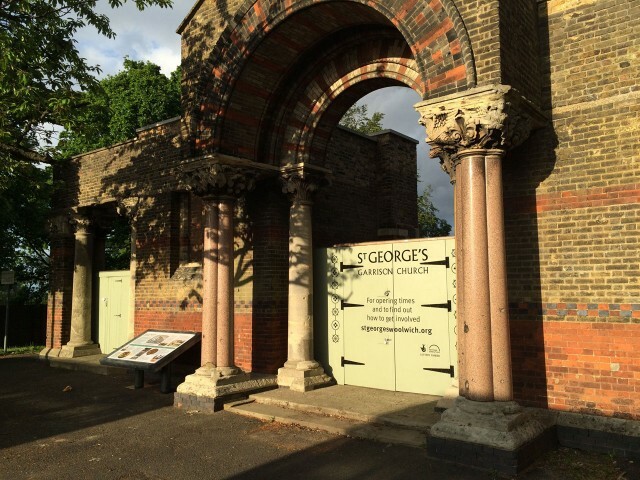 We look forward to working together with the newly formed Trust, the Woolwich Garrison Church Trust, to further raise funds, raise profile and increase local interaction. 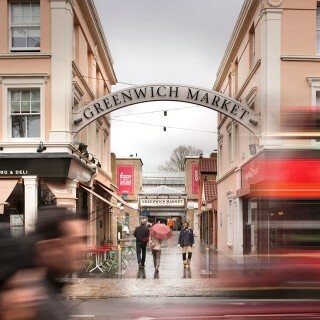 Fit Creative has a good eye for design, and a sensitivity that suits the unusual character of our historic site. In addition, a cheerful and efficient service is offered – perfect for organisations operating with small staff teams. In order to help identify the Church a simply word mark was designed which could be contained within a shape which was sympathetic to the new roof shape, and also has a variant which adds the Woolwich, London locater. 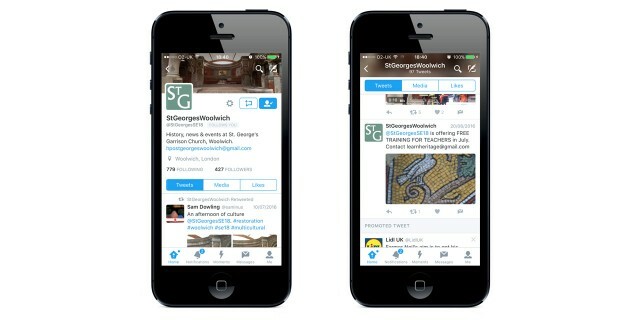 Using social media platforms will allow the Church to stay relevant and engaged with local audiences. A shorthand was created for use in social media which often requires a small square icon. One of the first things we did was to apply a vinyl message to the temporary gates in order to be able to engage with the local community even as other communications items such as the sign and website were still in progress. This also helped create a space as it notified to locals that there was something going on within this once derelict site. Built as a fully responsive website with CMS for client control of content so that the Trust can manage updating it themselves. News and Events can be updated and the History section added to as new information is uncovered. 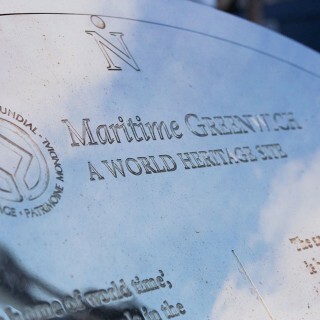 The structure reflects the need for the website to appeal to the community and heritage lovers. The homepage leads with the three engagement areas of See, Learn and Join in, and the shapes of the promos reflect the shape of the new roof. The overall design of the website shows large images of the site in order to celebrate its stunning architecture. A key element of making the site more accessible especially on days when the doors are not open to the public was the new interpretation sign. Designed to reflect the proportions of the pillars on the front of the church and positioned and aligned to work with the architecture, this bespoke sign is both durable with vandal proof paint and changeable should the graphics inside them need developing or adding to. 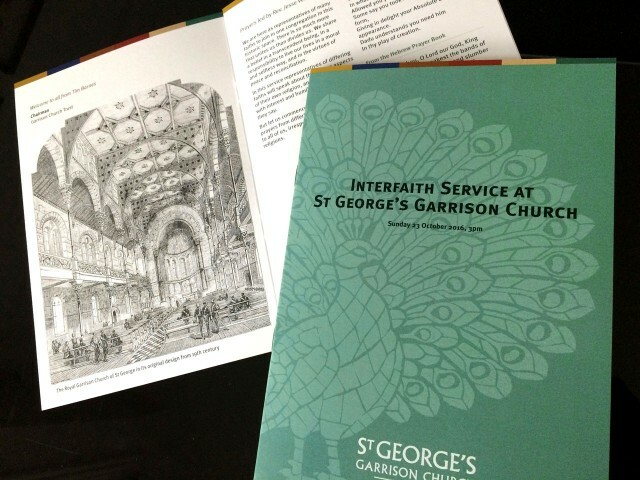 The design of the panel matches the design of the website and other literature. 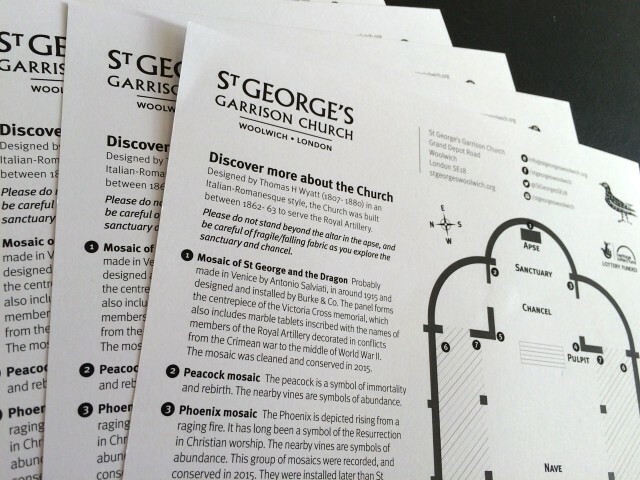 A simple single colour sheet handout was designed to help visitors to the Church better understand the site and its history whilst walking around. With a tear off panel to sign up to the newsletter, and box to hold those forms, it means the Trust can start to engage with visitors. 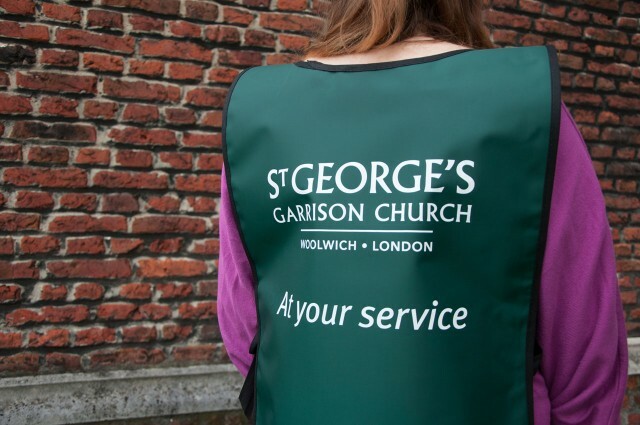 Low cost tabards branded with logo and witty message means that during busy events, volunteers and guides can be easily identified. 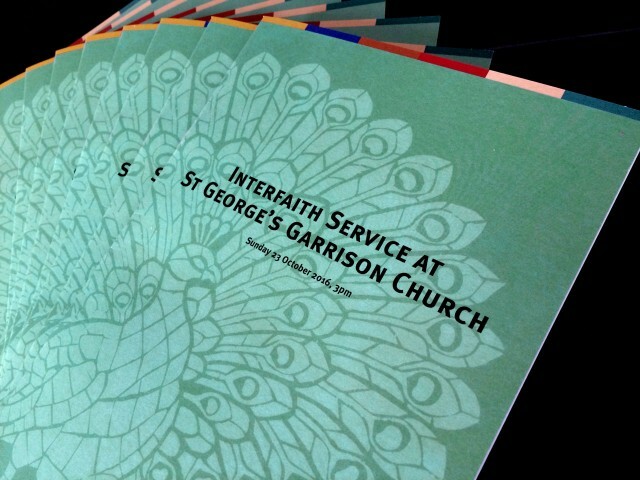 On-going events at the Church site require programmes to support them and to raise the profile of St George's. 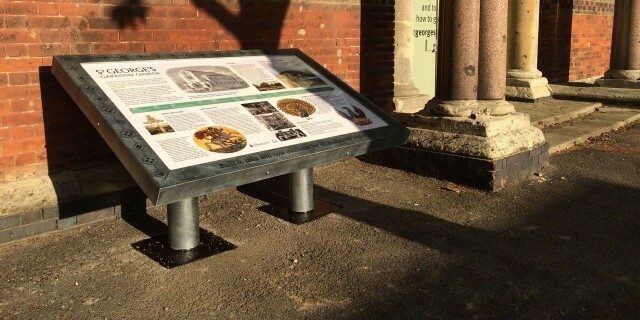 A permanent sign structure with interpretation panel to share the history, background and construction details of the Church with passers by. 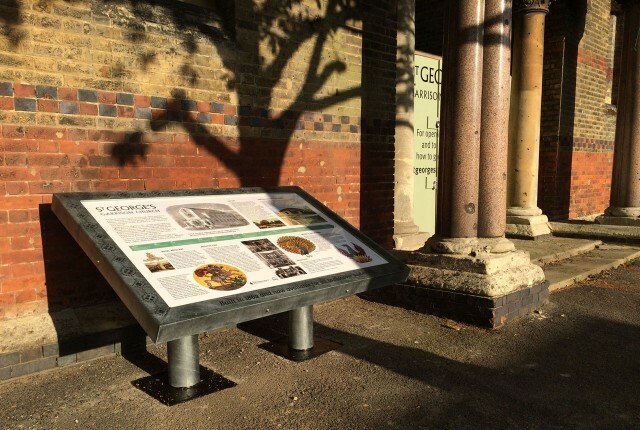 A new responsive website to enable this conserved Church site to reach a wider audience interested in heritage and engage with locals interested in events and activities on site.